I gave up sugar in September 2012 after reading Sweet Poison by David Gillespie and then stumbling across Sarah Wilson's I Quit Sugar program. While I don't remember the exact date I do remember jumping up and clearing out the pantry and being horrified at the amount of sugar that was hiding in our everyday products. I thought we were eating quite healthily but the bags of stuff I threw away said otherwise! One group of products that didn't survive the great cull of 2012 were condiments. I knew that some sauces were quite sweet but I was astounded that our tomato sauce was over 25% sugar, the BBQ sauce around 40% and the sweet chilli contained a whopping 60%! I know you don't use much at a time but if I was going to be eating something so packed with sugar I would have rather had a chocolate bar or bowl of ice cream! While I make most things from scratch these days, especially since buying our Thermomix, I have never really made any sauces. I just didn't think I would be able to make a version that the kids would really like and I didn't think we would get through a whole batch before it went off. 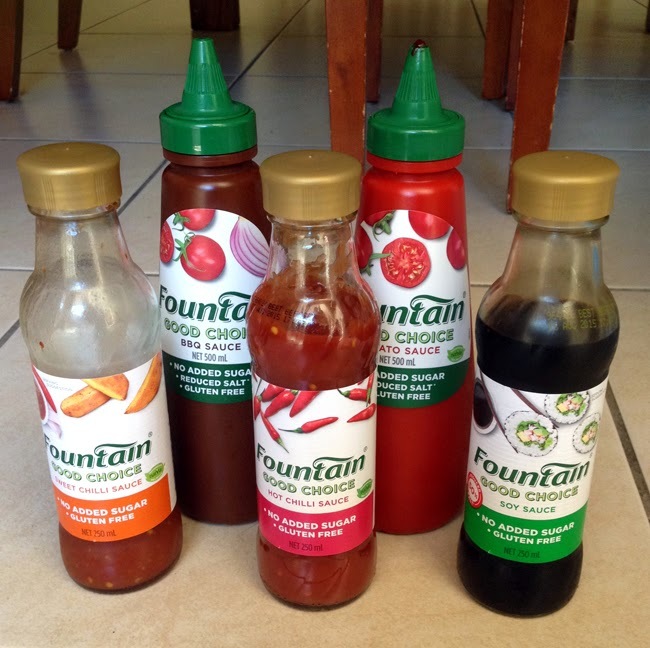 So I was delighted to receive a pack of Fountain Good Choice Sauces to review thanks to Product Talk by Nuffnang. All the sauces are free of both sugar and gluten and the pack included a squeezy bottle each of tomato and barbeque sauces, and glass bottles of sweet chilli, hot chilli and soy sauces. Instead of sugar the sauces are all sweetened with Natvia which is an alternative sweetener using stevia. We had a BBQ at Oscar's birthday party last weekend and I knew this would be perhaps the greatest test for the Good Choice Tomato and BBQ sauces. Would the kids be able to taste the difference? Would the adults notice the labels on the bottles? Well, I can say that both sauces got the thumbs up from all our big and little taste testers, every sausage got eaten and there was not a single complaint!! As for the other sauces I decided the best test for them would be a burger. I mean, it's not a real burger unless there's sauce dripping from your chin! 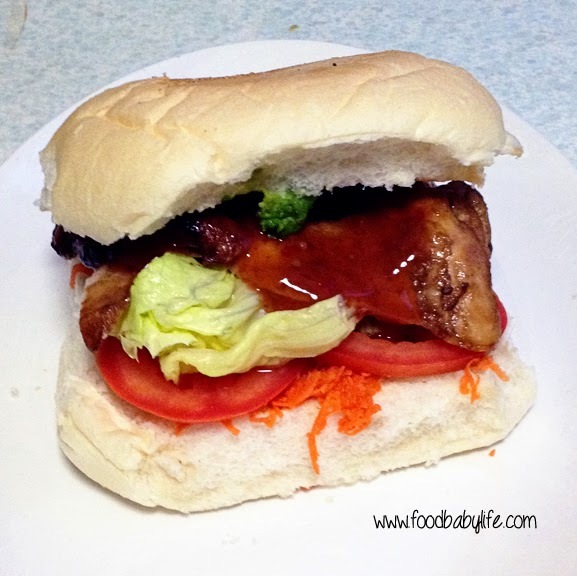 I came up with this simple marinated chicken burger and it was SO good: lick-your-fingers-to-savour-every-last-bit good. I was surprised how spicy the sweet chilli sauce was (in a good way) but the hot one was too hot for me. In fact you can tell just how much we like the sweet chilli sauce as by the time I got around to taking the photo of the bottles it was half empty! Place all ingredients into a large ziplock bag. Seal the bag, removing as much air as possible. Massage the sauces into the chicken pieces until well covered and then leave to marinate in the fridge for at least a 2 hours. The chicken pieces can be fried, grilled or barbecued until cooked through. I baked mine at 200 degrees C for approximately 20 minutes (make sure you check they are cooked through). Cover the chicken pieces with foil and leave to rest for 10 minutes while you prepare the burgers. Assemble your burgers with your favourite salad ingredients, place a piece of chicken on top and drizzle over some sweet or hot chilli sauce to taste. So. Would I buy these for myself? Yes but I'd still use them in moderation. There's not too much research into stevia yet and I've gotten my kids out of the habit of smothering everything in sauce so for us these sauces would still be a 'sometimes' food. That being said I do love that this range is available and for anyone who wants to switch to something healthier but is worried the kids would reject it, try these! The full range is available at Woolworths both in store and online. *This is NOT a sponsored post. I received product for review and all thoughts and opinions are my own.